Does Marketing Today Start with a J? | Marketing…pfft! Does Marketing Today Start with a J? One of my favorite books is The J-Curve: A New Way to Understand Why Nations Rise and Fall by Ian Bremmer. 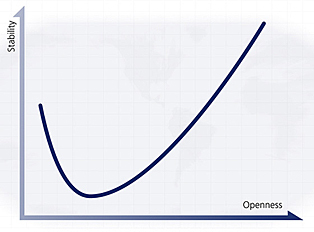 Bremmer uses a simple J-shaped curve to show the relationship between a country’s economic and political openness and its relative stability as a nation. The theory is genius in its simplicity. Nations that are closed politically and/or economically can achieve some level of stability by controlling access to information, repression, and limiting the power of the individual. Bremmer uses North Korea and Cuba as examples. On the other side of the J-Curve, we have countries like the United States and the UK. Through their more open economic and political systems, these countries enjoy a level of stability much greater than closed societies. The stability achieved by countries that inhibit political or economic freedom is inherently limited. To go from a closed society to an open one, to achieve that greater level of long-term stability, countries must pass through a phase of intense instability, creating the dip in the curve that results in the ‘J’ shape. I won’t go into all the examples Bremmer points out, but they’re pretty tough to argue with. You don’t have to stretch your imagination very far to apply this simple principle to the state of marketing today. Consider openness as a company’s willingness to embrace transparency, free flow of information, develop experiences that inspire others to tell the company’s story, and ultimately surrender control of the message. Compare the long-term stability of those companies to others determined to control every aspect of the message; to those who insist on broadcasting one-way dialogues about how great their products are, and why you’ll be miserable unless you buy one. The smart money’s on the first group of companies. But in fact, it’s no longer a choice. There are forces driving marketing to the right side of the J-curve. The way people interact in their personal lives has changed their expectations of how companies should engage with them. Dialogues are had in 140-character chunks. I can’t remember the last time I went to a news website. These days, Twitter, Flipboard and Facebook are my breaking news alert services. I have unprecedented access to information. I watched the US presidential debates with the fact checker apps open on my iPad; the candidates no longer controlled the message. When I interact with someone through social media, I expect a response. Fast. Research says the shelf life of a Facebook post is about 18 hours. No one checks these experiences at the door when deciding what to buy. Forces are moving marketing toward openness. Marketing that refuses to recognize this undeniable fact will become irrelevant. It will be ignored, and the companies responsible will fail. But here’s the most important bit. Ready? Companies must understand where on the J-curve they sit, and brace themselves for the period of instability they’re sure to go through as they move from left to right. Prepare for the dip in the J, it could be a rough ride. You might not like what your customers say about you. It’ll probably be really tough to prove return on investment in the short term. You might even lose some money. But if you know that period of instability is coming, you’ll be more prepared to deal with its short-term consequences. Appreciate it’s a necessary means to a greater end, and get your internal PR campaign ready. Two additional words of caution. While we give up more and more control of the message, the conversation can and must be orchestrated. Help your customers find what they’re looking for and give them avenues to have open dialogues with you and each other.